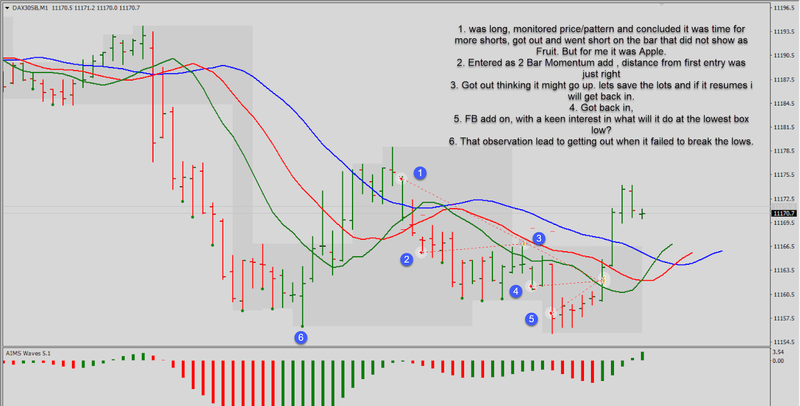 I trade the EU GU UJ and Gold on the Hourly Time Frame. That is my bit of Swing trading. I'm busy trading the DAX on the M1 chart but from time to time, I check these H1 charts. H1 chart does not really need checking every hour. You check them the night before and in the morning pre London Open. Usually if it's going to set-up for something, You will see it before London Open. Clearly a Downtrend. A lovely Apple within a Sideways Wave 4. Took first Apple and added below box. Mistake: should have exited on fruit high before end of the week since it was Friday. It was my intention but literally forgot. I remember going "oops" while sitting with wife in the bedroom past 10 pm uk on Friday. I said, "I might have left the EU trades running". 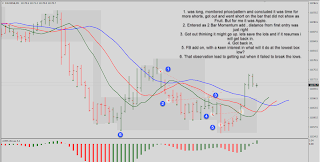 But I had the SL set at the Entry level of the box breakout add on which was hit on Monday. Mistakes like these could some times cost some money.